Improve the look of your skin without cosmetic surgery. The active ingredient in Avotone, Acetyl Hexapeptide-3 (Argireline), has been proven to reduce the depth of the wrinkles in the face caused by the contraction of the muscles by facial expression, especially around the eyes and the forehead. By relaxing these muscles Avotone can be an effective alternative to cosmetic surgery and injections without painful side effects. 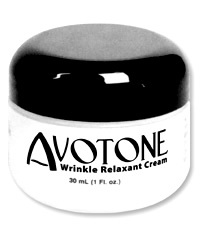 The proprietary formulation of Avotone uses a 10% solution of Acetyl Hexapeptide-3 (Argireline) along with advanced collagen builders and natural avocado oil moisturizers to both reduce the appearance of fine lines and wrinkles and give you what our customers feel is the best anti wrinkle cream on the market. Researches shows that having too many active ingredients in a product not only slows absorption and leaves a greasy feel but can also create dangerous side effects. Avotone is formulated specifically to target the appearance of fine lines and wrinkles while absorbing completely all with no harmful interactions. Everyday we hear news of the dangers of cosmetic surgery and cosmetic injections. Avotone is a safe, non-invasive alternative that not only helps to prevent aging of the skin induced by repeated facial movements. This can help to slow the aging process and help to give you what one customer calls "a non surgical face lift". Order Now!